Black Roof Streaks, Moss, and Mildew removed safely, without further damage. Roof Mold is often thought to be the end of a roof’s life by homeowners. This is simply not true. With the proper pressure, proper selection of chemicals, the roofs can be restored to their former condition and appearance. Black Streaks are “Gloeocapsa Magma”, a form of mold. Left untreated the streaks WILL turn into algae blooms, with a greenish color and clumpy appearance. This mold will not go away by itself. It will only get worse. The only way to get rid of it is to have Impact Property Services, based in Rockland County, to come and apply a chemical, and lightly rinse the roof. Our company has trained technicians and hi tech equipment to get the job done right. We know roofs. We use a non toxic chemical with additives that inhibit some future mold growth. This procedure, coupled with hot water, will get your roof cleaner, quicker, and looking better longer than any other companies’ procedures. Many contractors or roofers will tell you that you need a new roof if it looks bad. This is totally incorrect. We have saved hundreds of clients, hundreds of thousands of dollars on unnecessary roof repairs/replacements. Many homeowners completely shocked when we give them the estimate for the roof cleaning. The price is a fraction of a percent for a roof replacement. If you are selling a home, please don’t even think of putting it on the market without cleaning the roof first. That is the first thing people see, and the first thing that pops into their head is, “ I have to fix that”. Already they are thinking about dumping money into a house they don’t own yet. Clean houses signify the owners took care it. You will sell the house faster. It is a FACT!! By choosing Impact Property Services, you are not only getting the right roof cleaning company, The right attitude, the right price, and quality workmanship, that you will not find anywhere else. We anticipate things that may come up during the course of a project, and plan accordingly. We protect the property like it was our own. We have an outstanding base of loyal clients, that continue to use our services each year. This is a testament to our commitment to service. We would love to be your “go to” guys (and Girls) for any projects that you need completed. If you have any questions that are not clearly answered on this site, please do not hesitate to call our offices, and we will be glad to help answer any questions that you have. 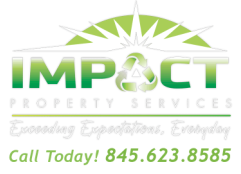 Impact Property Services……"Exceeding Expectations, Everyday". We Will Make Your Roof Look Like New, Call Impact Property Services today at 845.623.8585 for your FREE estimate!